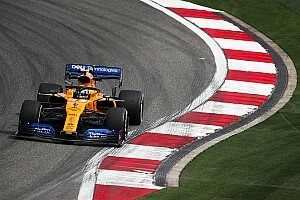 Renault, a fully manufacturer-funded team, may have come across as underachievers in the last few seasons, but having retaken control of the ailing Lotus entity at the backend of 2015 it has had to go through a few growing pains. 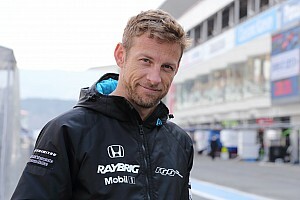 Its withdrawal as a manufacturer at the end of the 2011 campaign had seen it fall into private ownership and although some success initially followed, the team lost key personnel and began to fall down the pecking order. 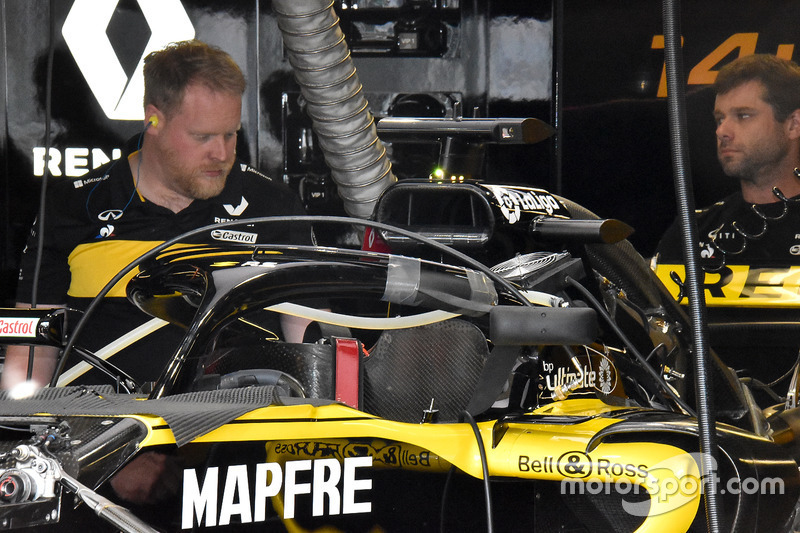 Renault went about a total overhaul of the Enstone operation over the last three years, with heavy investment in both infrastructure and the recruitment of new personnel. 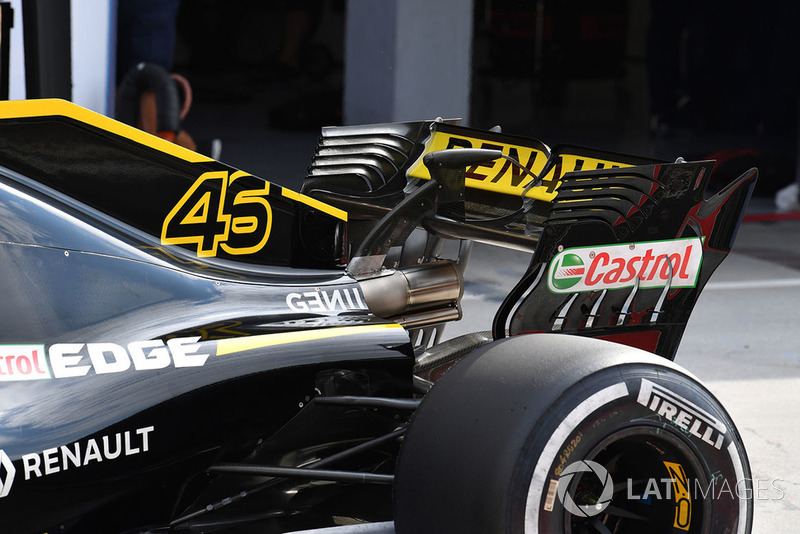 Having utilsed the traditional short-stack ‘S’-duct solution in previous years the team switched to the longer iteration for 2018 – a design made possible by various regulation changes in the last few seasons and used by other teams in recent years. 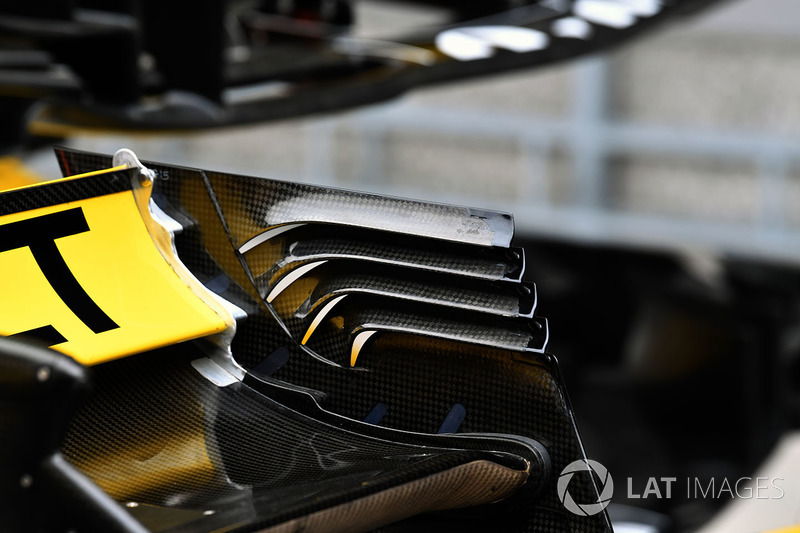 The RS18’s elongated ‘S’-duct solution used several inlets to power the aerodynamic device, whilst you’ll also note that the front wing pillars featured a slot, a feature seen used by McLaren and Ferrari. 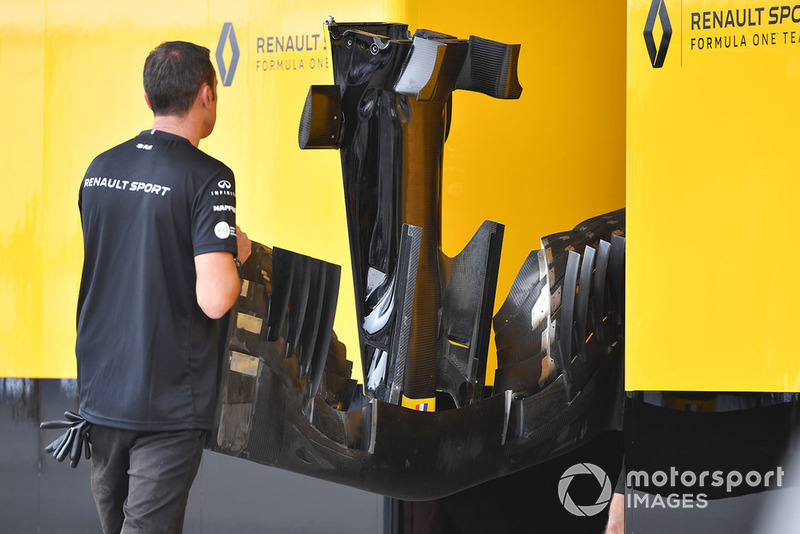 Here’s a look inside the nosecone, in order that you can see how that airflow is moved from underside to the upper surface of the chassis. 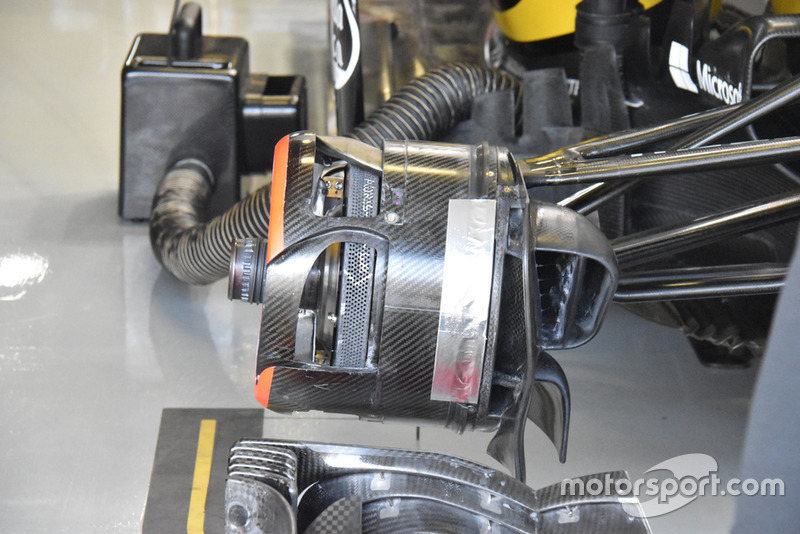 When it comes to cooling the front brakes Renault had numerous options up its sleeves, the left iteration shows a short drum casing that fully exposes the disc, while on the right hand side is the enclosed version which includes crossover pipework. 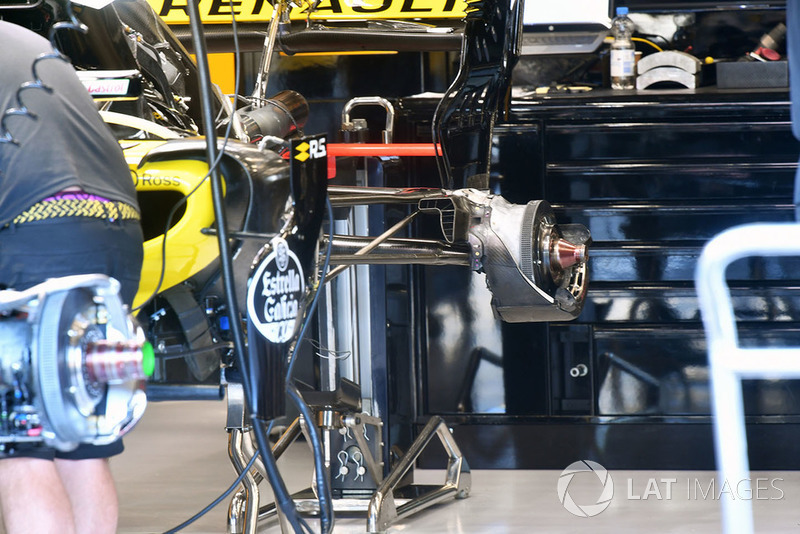 This shot of the RS18 in a state of undress allows us to appreciate the airflows pathway from the inlet to the rear brake caliper. 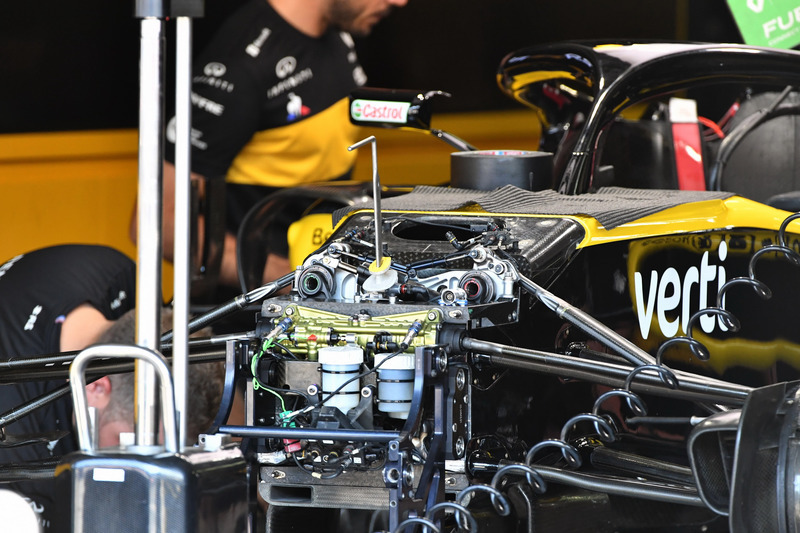 A look under the skin of the front-end of the RS18, including the front suspension and brake cylinders. 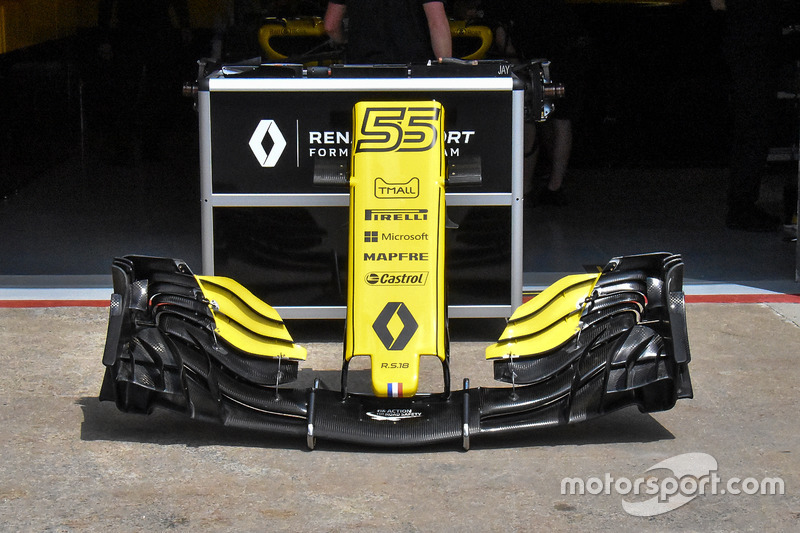 Renault started to play around with different front wing flap lengths and angles in the opening phase of the season, here’s one specification used in Austria on Carlos Sainz Jr’s car. 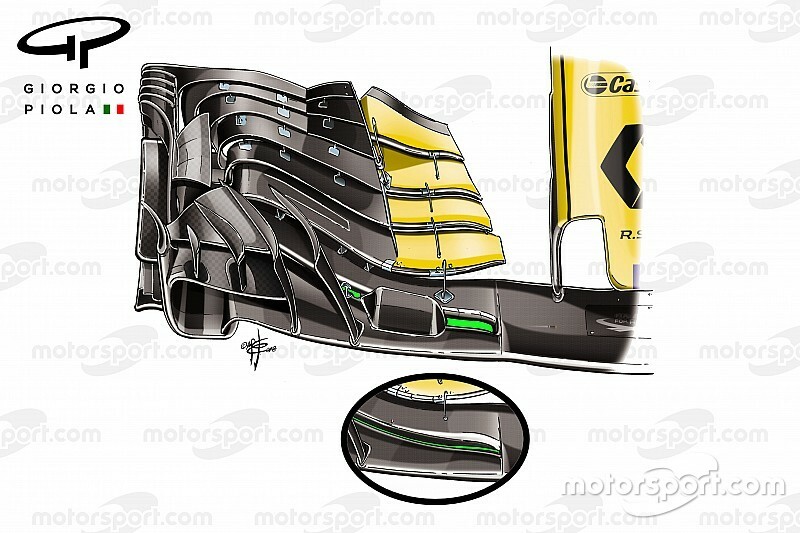 As a direct comparison here’s the wing used on Nico Hulkenberg’s car. 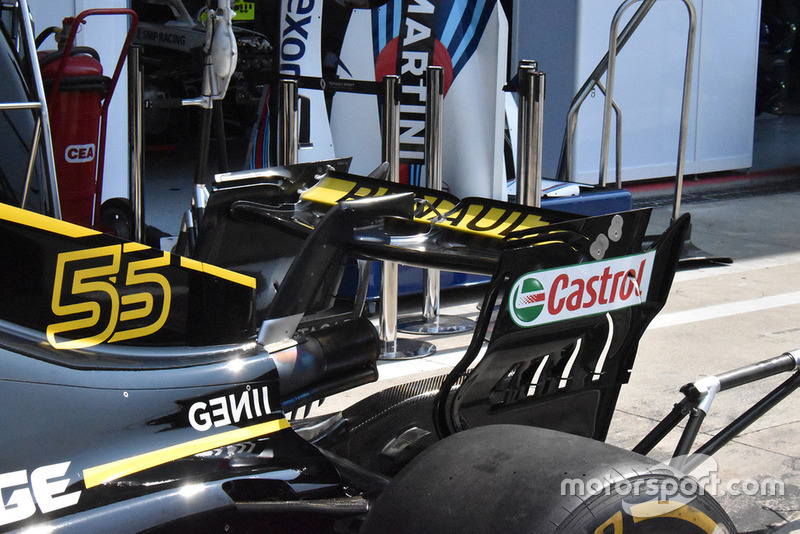 A close-up of Renault’s rear wing endplate louvres which feature the open-end style approach pioneered by Toro Rosso. 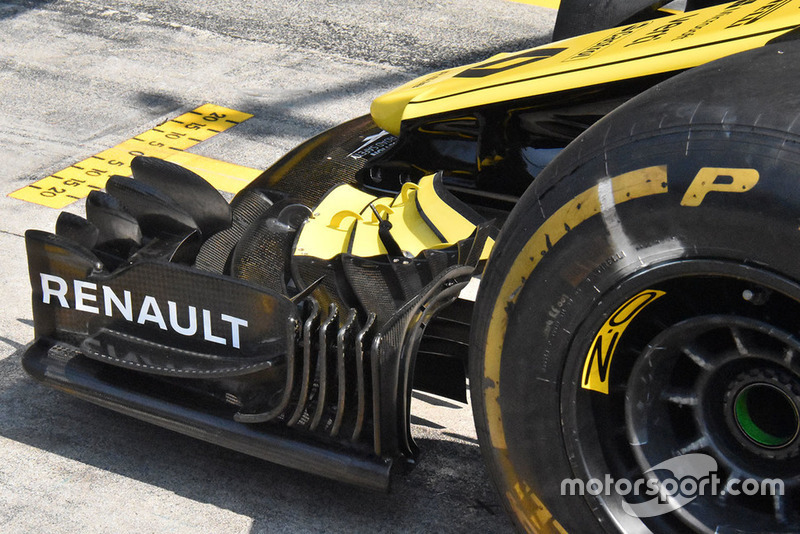 This shot of the updated bargeboards used by Renault from the Canadian GP shows just how detailed the footplate had become as a complex array of striations were used to manipulate the flow field. 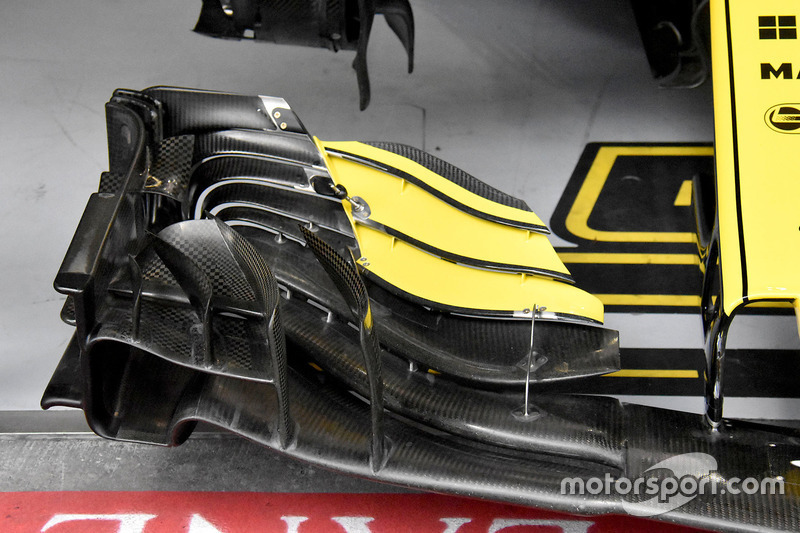 A close up of the previous specification bargeboards used by Renault up until the Canadian GP for comparison. 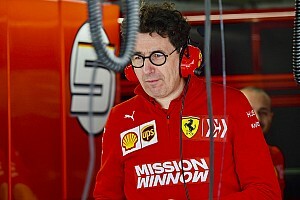 The team also briefly tested some halo-mounted mirrors at the Canadian GP, as they looked set to follow in Ferrari’s footsteps. 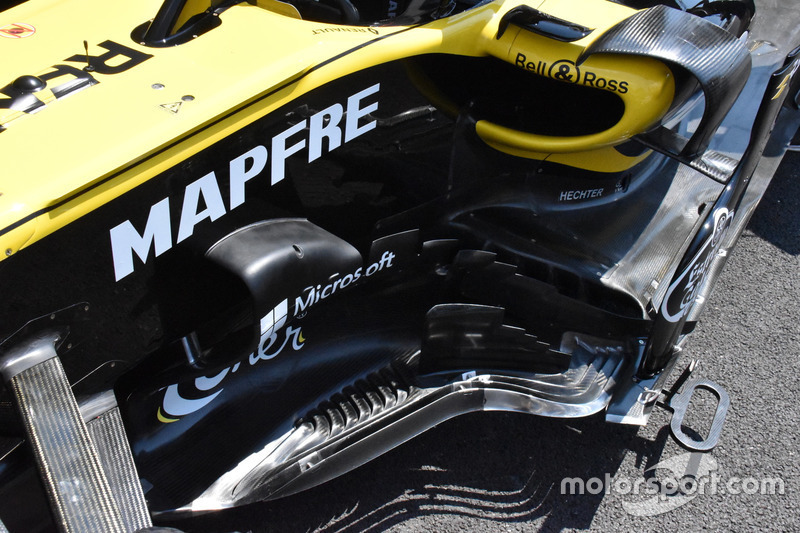 Renault introduced a new front wing concept at the Hungarian GP, which saw a much wider static section in the outboard section to help deal with shaping the wake generated by the front tyre. 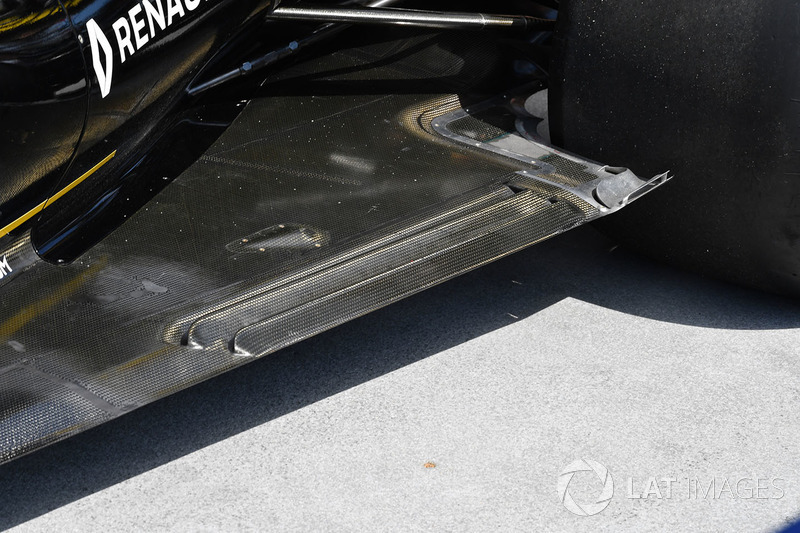 Revisions to the endplate and outboard footplate were also made to further solidify this effect, whilst the flap adjuster and the total area they cover was revised in order that the Y250 could be manipulated without too much overall loss. 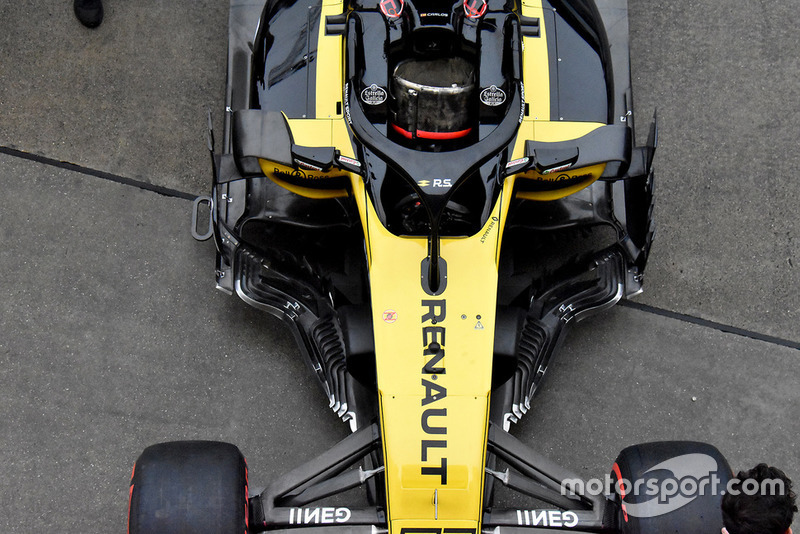 You’ll also note that the team varied the slot opening in the main plane, utilising a wedge to blank off a particular section when the need arose. 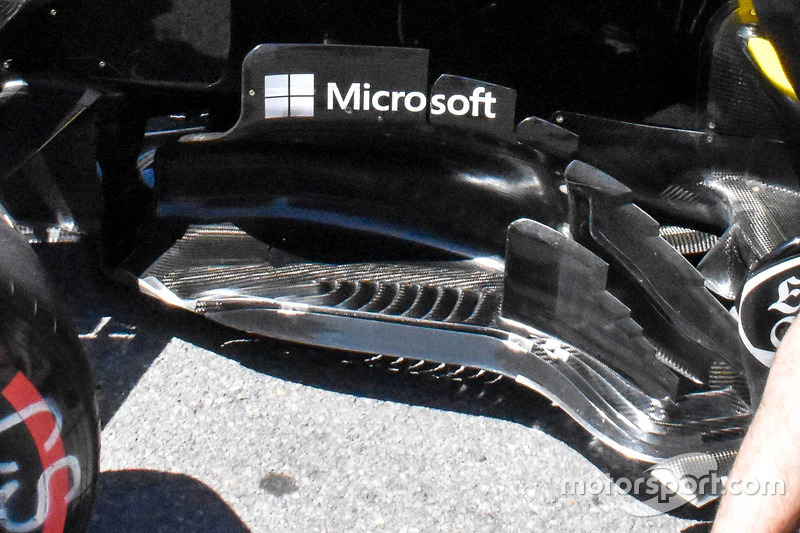 A side view of the endplate shows how the designers have split the rearmost surface up into multiple sections. 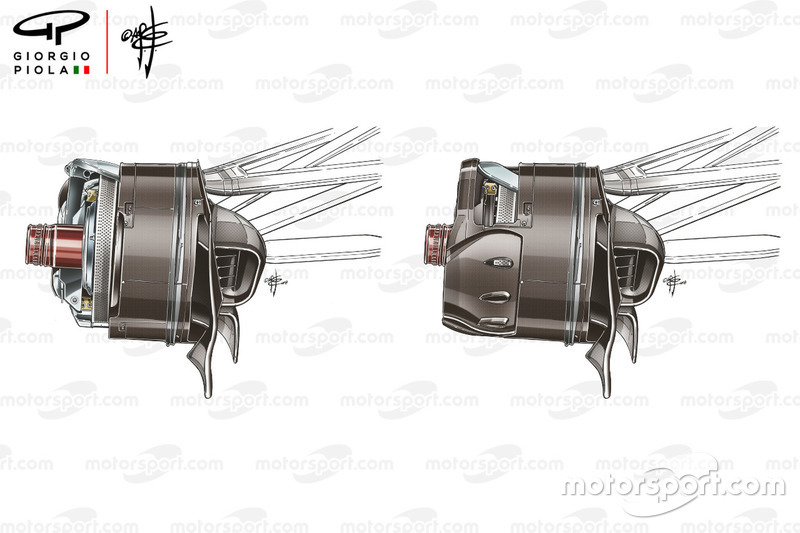 A comparison showing the older configuration with just two sections split off at the rear of the endplate. A look at the most up-to-date floor at the Hungarian GP which includes two elongated longitudinal slots parallel to the floors edge that became commonplace up and down the grid in 2018. 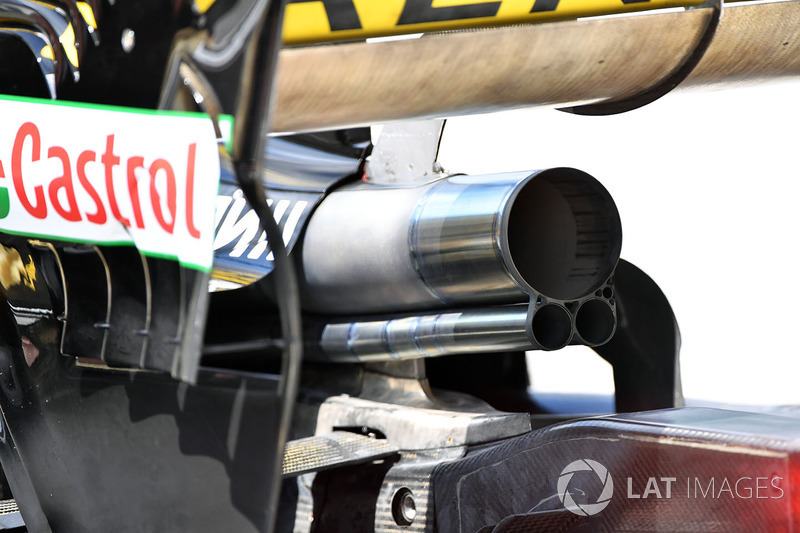 A close up of the RS18’s exhaust solution, which saw the main outlet mounted closer to the underside of the rear wing and shotgun style layout utilised for the wastegate outlets. 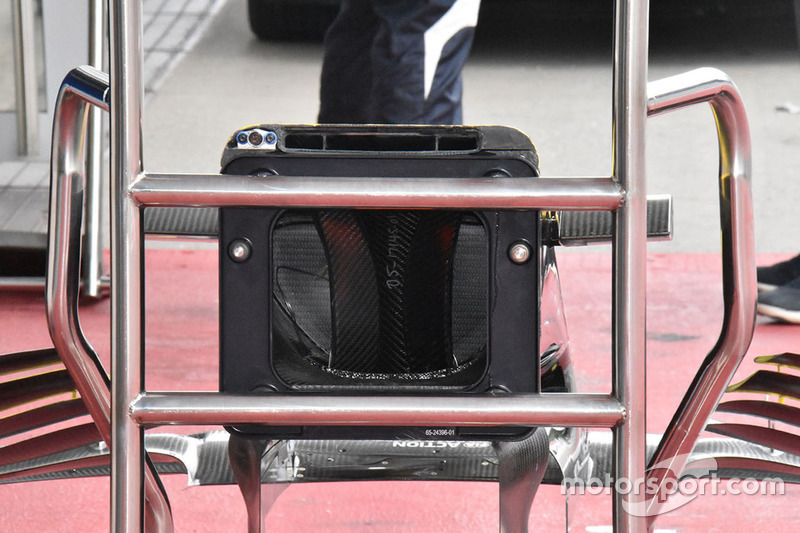 The team mounted this kiel probe array on the leading edge of the floor at the post GP test in Hungary as it evaluated how changes could be made to improve flow through to the diffuser. 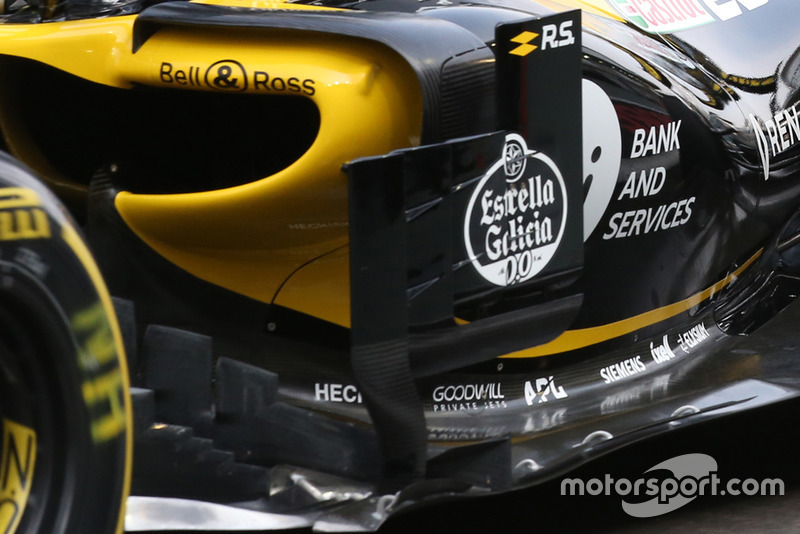 Renault’s rear wing in high downforce trim, complete with the McLaren style endplate strakes. 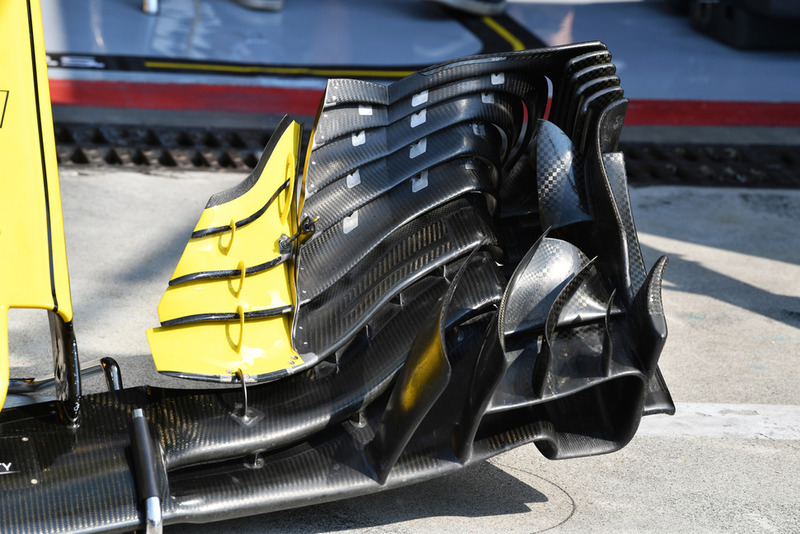 An overview of Renault’s latest specification front wing at the Italian GP shows how the team have moved to the more inboard flap adjuster. 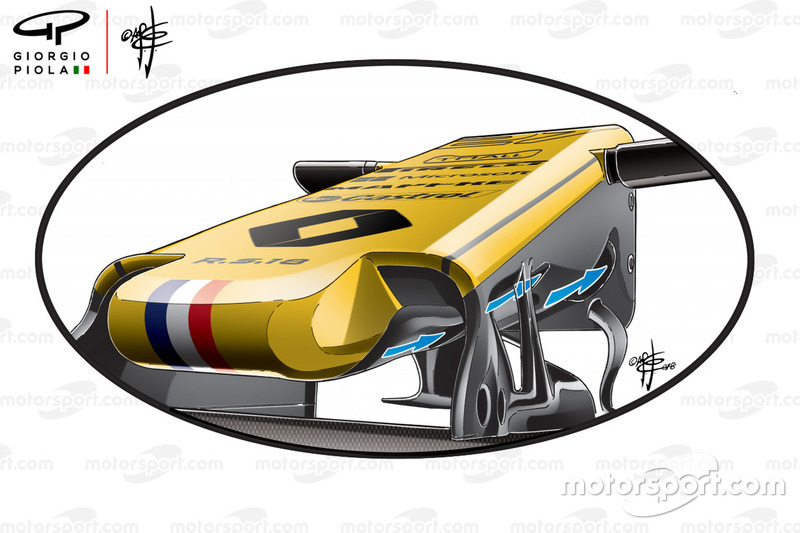 The team also had a very low downforce rear wing offering in Italy, which featured a spoon-style design. 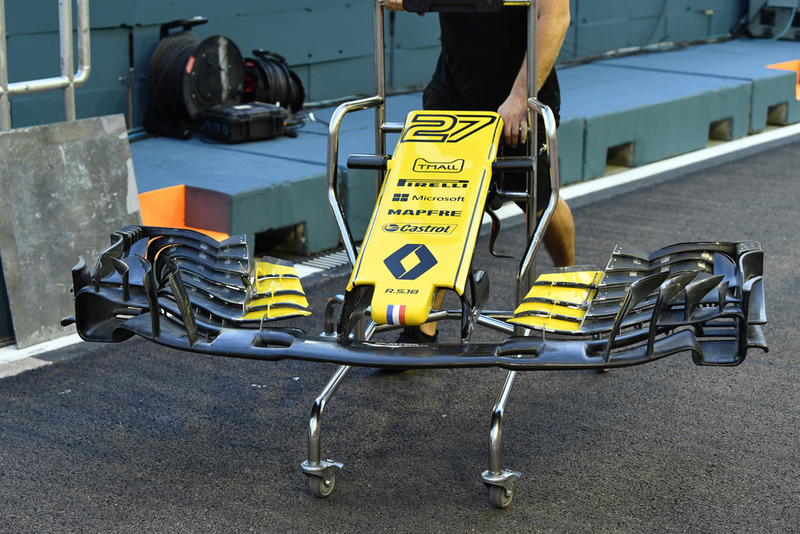 A mechanic wheels the team's latest specification front wing down the pitlane in Singapore, note how a section has been put into the wing to divide the main plane slot. 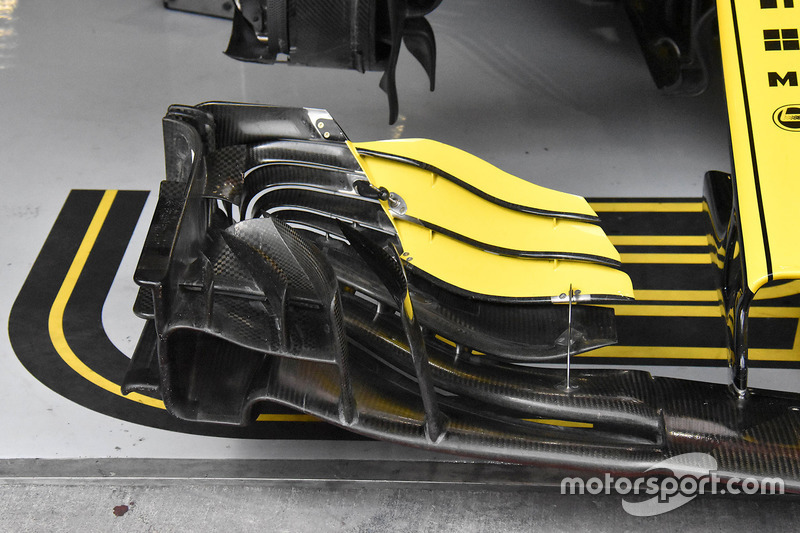 As a comparison here’s the older specification front wing, which features a more conventional adjuster position and longer flaps. 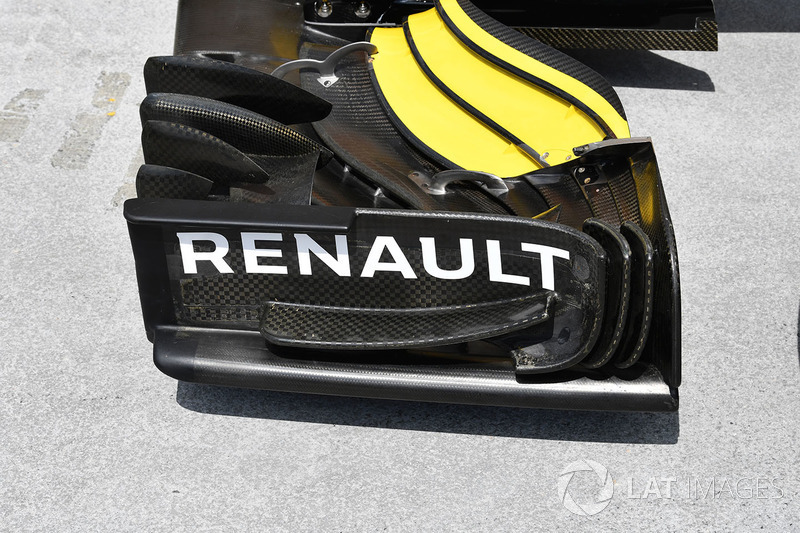 Renault introduced a new deflector panel in Singapore, reminiscent of the designs used elsewhere up and down the grid. 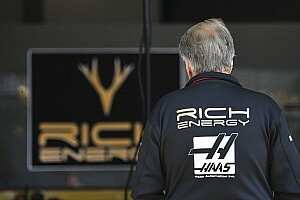 A rare glimpse of the underside of the front wing as the mechanics carry it into the garage at the Japanese GP. 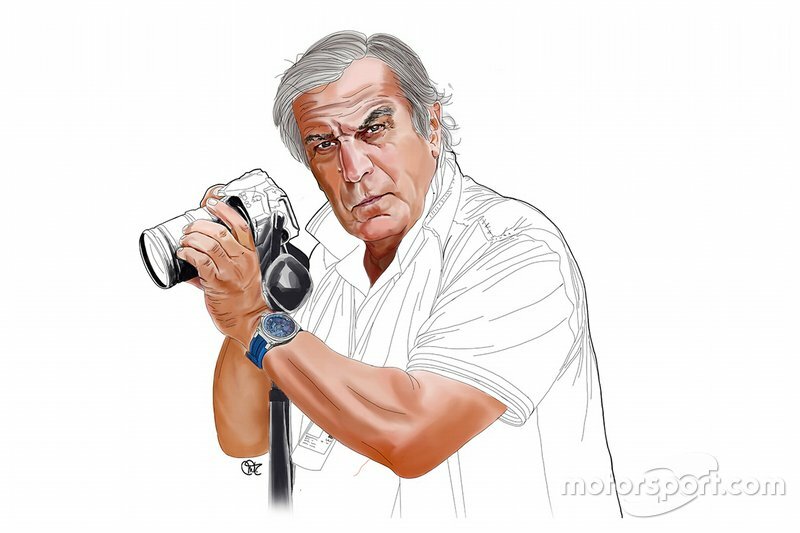 A fascinating overview of the RS18 taken by Giorgio in Japan. 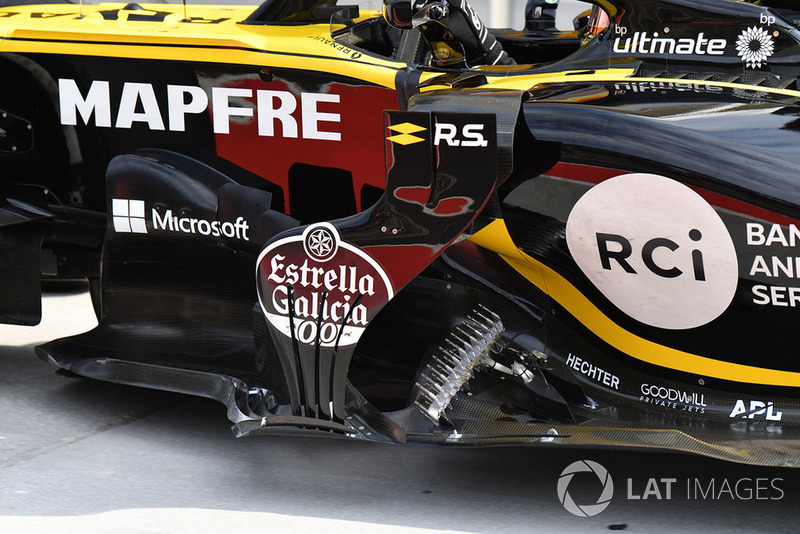 The team ran a hybrid version of the front brake duct assembly in Mexico, as it installed the outer drum fairing but left the crossover pipework in the parts bin.